Traffic Signal Installation and Repair - North Cherokee Electrical, Inc.
North Cherokee Electrical Contractor’s roadway projects often involve installation of complete Traffic Signal packages, from removal of the old and damaged signals to installation of new traffic signals, and street lights. Throughout each project, we focus on keeping disruption to the community and worksite environment to a minimum, and maintain the strictest erosion-control policies to minimize any potential discharge of harmful pollutants into the surrounding environment. North Cherokee Electrical Contractor’s highly skilled team of professionals are ready to meet all your roadwork requirements. From roadway signage, camera systems, traffic signals and Advanced Traffic Management Systems, North Cherokee Electrical Contractors is helping bring Georgia into the 21st century of effective traffic management by providing men and materials to meet Georgia’s growing demands and at the same time not impeding existing traffic conditions. That makes us the “go to” company for many city and county governments. We maintain crews of men and materials so we can offer 24 Hour Emergency Service, be it storms or a roadside accident we can mobilize within hours and have your traffic signals back up and running. All our work includes warranties and guarantees as designated in a projects specifications, and response to maintenance and operational issues. Upon final acceptance, we make a transfer of these services to the local government or other agency that will be responsible for continuing maintenance and operation. 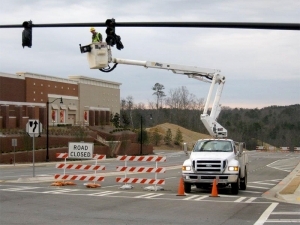 We can design and install Traffic Signal systems, with the use of state of the art software and the experienced staff on hand we are able to come up with solutions for all your roadway needs.